Content marketing productivity involves more than just creating great content, it also involves tracking and applying the good ideas you find in the blog posts you read each week. Each week, for example, you encounter a staggering amount of information and good ideas. Even if you only read the 10 new blog posts that appear each week on the Content Marketing Institute blog, and the average blog post only contains five ideas, that’s still a lot of information to absorb and catalog for future reference. When you add those 50 ideas to the other ideas you find across the web, social communities and other media, your information management tasks can quickly become overwhelming. The following is the solution I came up with to track the consuming tsunami of valuable ideas, strategies, and tips. I needed an easy way to increase my comprehension of individual posts plus I needed a way to quickly and easily relocate important posts in the future. Just like the dashboard of your automobile allows you to monitor numerous functions at a glance (i.e., current speed, miles traveled, available gasoline, current radio station, and comfort settings, etc. ), an idea dashboard helps you monitor ideas worthy of further study. Relevance: Dashboards focus on the important, not the trivial. In a car, for example, the speedometer is larger than the call letters of the current radio station or the inside temperature, giving it higher priority in your field of view. Likewise, your idea dashboard doesn’t need to list every blog post, just those you’re most likely to want to revisit. Brevity: Listings in an idea dashboard do not have to include all the information you found in the original post. All that’s needed is enough information to summarize the post and its key ideas, providing a reason for you to click the link back to the original post. Ease of use: An idea dashboard must be easy to update. You don’t want to add to your daily workload — the less time it takes to add a blog post to your customized reference library, the more likely you are to keep it updated! Ideally, you should be able to add references to new posts in under 10 minutes. It includes a visual component. In order to easily access previous posts, your idea dashboard must be “scannable;” i.e., you have be able to select relevant posts at a glance. Search-ability: In addition to visually scanning and selecting for relevant topics, you must be able to easily search, or filter, your dashboard to locate the information you’re looking for as quickly as possible. Flexibility: When setting up your dashboard, it’s unlikely that you’ll “get it right” the first time. As a result, it must be easy to rearrange your dashboard to reflect your changing interests or priorities. With these criteria in mind, there are three steps involved in setting up and maintaining your idea dashboard. Selectivity is the key to success: Selectivity involves self-curation — identifying topics that are most relevant to you. If you’re not selective, instead of saving time, you’ll end up creating an additional source of information overload. Your goal is not to duplicate the Content Marketing Institute’s archives, but rather to index the articles that you will refer to often and, therefore, want to keep on hand. Start by choosing a few key categories of ideas and tips for your idea dashboard — I suggest starting with no more than three or four. The fewer you choose, the more useful you’re likely to find your dashboard. Plus, if necessary, you can always add more categories. In my case, the categories I chose were design, content, productivity, and miscellaneous. Next, choose the right format for your dashboard. Your two primary options are spreadsheets (like Excel, or Google Docs) and mind maps. Mind mapping software presents a more visual environment, making it easy to scan titles and topics for desired information. 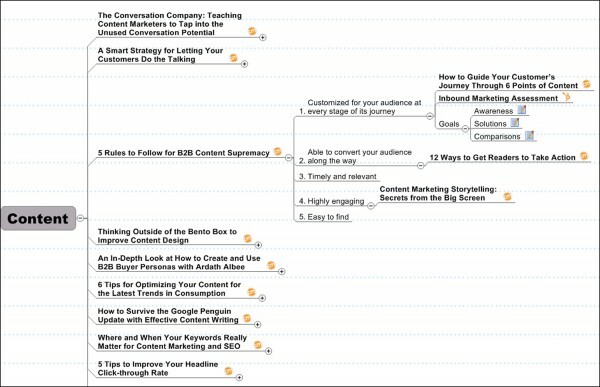 You can collapse mind maps to reveal just the blog post titles, or expand the maps you’ve created to view the contents of a particular blog post in greater detail. In the above example, notice how easy it is to view the main ideas in the expanded “Content” topic. Mind maps also allow you to include more details than spreadsheets can — you can include graphics, keywords, phrases, and sentences from the original blog posts, as well as including multiple links for each topic. Most importantly, at a later date, you can easily modify your dashboard by dragging the content topic ideas you create from category to category. Idea dashboards work best when you make updating them a habit, or part of your daily ritual. Consider setting aside a little time each day to review what your peers have written on the CMI blog and add the most personally relevant posts to your dashboard. 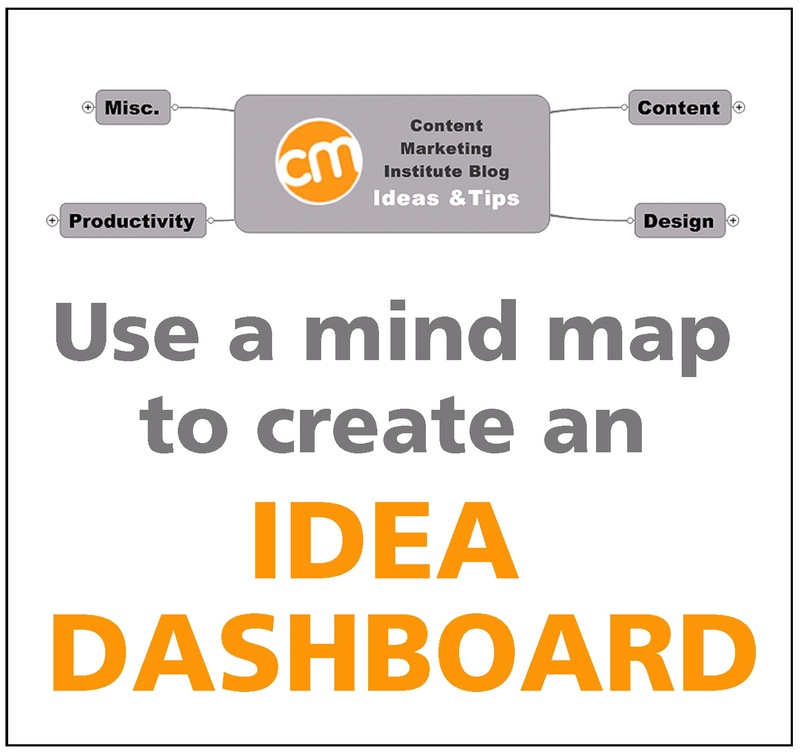 You should be able to add a new post to your idea dashboard in about 5 to 7 minutes. Blog post title: Start by copying and pasting the blog post title, as is, into your dashboard as a new topic. Later, you can analyze and “reverse engineer” the post and analyze why it was effective from the reader engagement and SEO points of view plus how you might model the title for your own content efforts. Add a link to the original post: Next, copy the blog post URL and link it to the title in your dashboard. This makes it easy for you to return to the post to reread it. Note that many mind mapping software programs will automatically insert the favicon, or graphic associated with the URL. (See the CMI logo shown below). Create subheads and note the key points: Next, copy, paste, and edit the key ideas you find in the articles to create subtopics in your mind map. You can often find key ideas formatted as subheads or appearing in lists in published articles. However, resist the temptation to copy every subhead you find. Instead, just copy the ideas that best summarize points of the post that are most relevant to you. To make each entry on the mind map easier to read and index, you will want to eliminate unnecessary words in the text as you add it to your map — short topics are much easier to scan and more likely to catch your eyes. Notes: Look for key sentences you can copy and paste directly into your map. Use the Notes feature found in most mind mapping programs to add additional information that will only appear when you click or roll over the Notes icon. (See the icons next to the three items in the list of Goals in the above example, and in the screenshot below.) Information that would be appropriate to add as a Note includes definitions, examples, ideas, suggestions, tips, or sentences worthy of being quoted in future projects. Reference links. Always include links to previous blog posts when they appear. Good ideas are timeless! Follow links and, if they are relevant, treat them as if the posts just appeared. The age of a post has no relationship to the importance of its ideas! The above are just suggestions. As you work with your own idea dashboard, you’ll undoubtedly come up with your own routine. Consistency, however, is extremely important. It’s not how much time you spend, but that you spend it every day. As few as 10 to 15 minutes a day can make a big difference in your ability to access relevant customized information at a later date, when you need it most. Divide and conquer: Subdivide large topics into subtopics. For example, I immediately divided Productivity into two subtopics: Tools and Techniques. Exercise restraint: Commit to brevity and simplicity. Only add the most relevant posts. (Don’t worry, there will still be plenty of content to use!) When adding information, avoid the temptation to include more details than just what’s needed to remind yourself why you considered the post important and worthy. Comments: When appropriate, use your mind mapping program’s comments feature to note the key reasons you decided to include that post in your dashboard. Resources and tags: If your mind mapping software program includes these features, use Resources to include the author’s name, so you can later search for all posts by the same author. Use Tags to further classify topics. Tags help you search for types of content ideas, such as copywriting, story telling, titles, call to action, etc. Cloud computing: Instead of saving your idea dashboard on your desktop or laptop computer, consider saving it online (cloud), with resources like Mindjet Connect, Dropbox, Evernote, or iCloud. These allow you to access your dashboard from any device with web access, and provide reliable backup, so that your dashboard is never lost if your device fails. Mobile mind mapping: Many mind mapping programs are available in multiple formats, including desktop/laptop versions and mobile versions for smartphones, iPads, and Android devices. Programs that are available in multiple formats increase the utility of your dashboard. Managing map size: When your map grows too large to easily scan the post titles, try copying and pasting the topics into a series of linked maps — in other words, instead of working with a single large map, link the key topics to four, or more, smaller maps. In addition to helping you manage the torrent of good ideas flowing by you every day, you’re likely to find that the daily exercise of reducing 800 to 1,500 word blog posts to a few key topics and 25 to 50 words increases your understanding of the post. Daily experience eliminating unnecessary words will also improve your writing and self-editing abilities, as you become more aware of the benefits of brevity. You’re likely to begin to write more carefully and become more confident in your ability to edit your own copy. Finally, additional uses for mind maps are likely to appear as you become more comfortable and efficient at working with the software and tools every day. New applications for mind mapping will suggest themselves to you, helping you bring new efficiency to your firm and your clients. Share your experiences tracking Content Marketing Institute blog post ideas for future reference. Do you already have an idea dashboard? How do you track important blog posts? How do you select which ones to include? Are you already using mind maps to track ideas? How would you benefit from an idea dashboard? Please share your comments, concerns, and suggestions below.